To find blood traces, even outside or in a room that has been cleaned, luminol is very useful, with the working solution sprayed on the area that has to be examined. 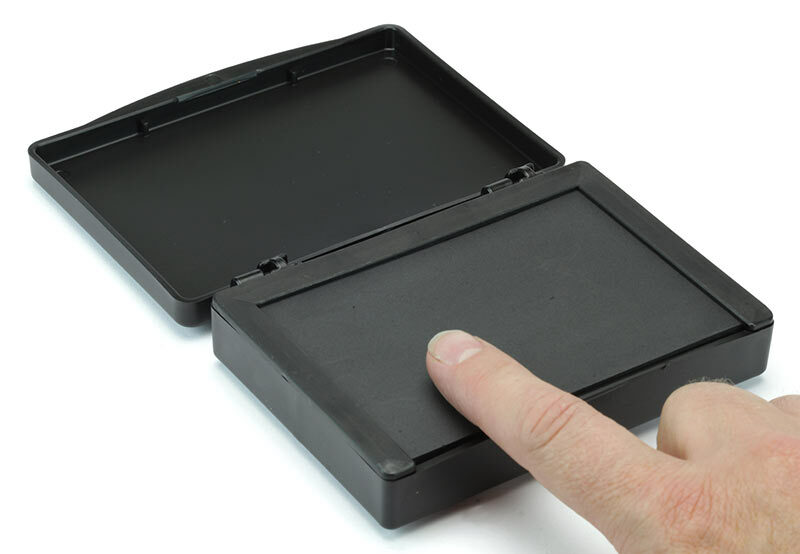 These ceramic type inkpads are made of a ceramic material in a plastic housing and use an (almost) colorless ink. The prints obtained with these pads are of excellent quality. A variety of investigation kits designed for fast general crime scene investigation. Various items for the protection and storage of crime scene evidence materials may also included. As the prints of the friction ridge pattern on the tip of the finger usually give the most important clues to the investigator, "latent prints" are almost equivalent to the fingerprint itself. The use of a variety of evidence markers and photographic measuring devices, has become an integral part of a crime scene investigation. When a handgun is fired the detonation of the cartridge and gas leakage around moving gun parts, in addition to blow-back from the muzzle, carries small particles (gunshot residue: GSR) to the shooter's hand. Footwear evidence is often the most abundant form of evidence at a crime scene and in some cases can prove to be as specific as a fingerprint. Toolmarks may provide intelligence regarding the type of tool used and where applicable, dimensions such as tip width or drill bit diameter.